The dining room needs a desk. It will house my wife’s computer and sewing stuff. Building the shelf for the back of the desk upside down. Building the shelving unit for the desk. The shelving unit is assembled. Now to flip the desk and attach the front legs. I attached the front desk legs with 3″ lag bolts. Desk is fully assembled and ready to go inside! The new desk is installed in the dining room, and is ready to be filled with computer and sewing stuff. This handy father has been tasked with how to recycle an old door into a new desk . 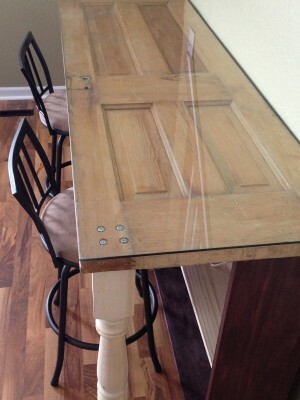 My wife has for some time been looking for a door that was “just the right size” for a desk in our dining room. The current desk is from my childhood, and neither matches the decor, nor the style that she enjoys. There is also beside the desk, a cheap three shelf particle wood book shelf of a common variety like you can buy at any store. The goal is to have a desk that not only fills the space, but also looks good and has storage for my wife’s computer and sewing stuff. She does alteration, and needs a large desk on which to work. The door she found is smaller than a standard door, and is solid wood. It measures 67″ tall by 24″ wide. It had an original white glass door knob and large square lock set on the outside of the door. The knobs and other hardware were removed to make the flattest surface possible for the desk. I decided to build a shelf under the desk the entire width of the piece. I’m using 1×10″ pine for the shelf. The front legs are made from two banister posts with the rounded portion cut off. I assembled the shelving unit using 3″ trim screws. I attached it to the door using 2″ drywall screws from the bottom up so the screw heads aren’t visible from the top. The front legs are attached from the top with 3″ lag bolts. I pre-drilled 1/4″ holes and counter sunk 3/4″ holes about 1/4″ deep to accept the lag bolt heads. Once assembled, I stained the shelving unit in a shade chosen by my wife, and then drilled holes for the removable middle shelves. The removable shelves and front legs were left unstained as an accent, and because she liked it better that way. The last part of the desk, was not something I could build, so I bought it from my local glass shop. I knew I wanted to top the door with glass so the recesses in the door could remain visible, while the working surface would be flat. The expert glass guy told me that what I wanted was 1/4″ glass with a smoothed edge. Out of curiosity, how much did the glass cost you? Curious about the price of a piece of cut glass as well! I spent $85 from my local glass company for the piece of glass. I said what I was doing, and they were knowledgeable and got me exactly what I needed. I paid about $90 for the glass.